Filtering wine using the All In One Wine Pump has never been easier! I personally recommended the use of the filters as a 1 time use. What I mean by that is as long as it is being used in the same day it should be fine. I do not save this filter for later use as it can develop problems down the road and ruin my entire batch of wine and for the cost of the filter (3 dollars) it is not worth it. 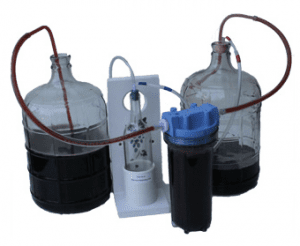 The filter should be able to filter approx 100 gallons of wine (all depending on filtration ) It is always recommended to polish your wines after you are able to read a newspaper thru the carboy. A 5 micron filter is recommended for reds and heavy bodied wines. A 1 micron filter is recommended for whites and your lighter fruit wines including your skeeter pee wines. You don’t have to mount the housing if you just want to leave it upright while filtering. Once done racking – remove the hose from the racking tube and lift the filter and turn it upside down. This process will empty all the excess wine in your filter housing while it is being filtered. I recommended indexing your filter housing – Why ? So you will know how much you need to tighten the filter housing to make a proper seal. First tighten housing without filter (good hand strength only ) then take a paint marker or a sharpie and draw a index line on the upper and lower portion of the housing. You now have a reference point once you install your filter to know how tight you are going have to tighten in order to get a proper seal. I do not recommend filtering and bottling at the same time. You want continuous flow thru the filter element in order to get proper filtration and bottling in the process will not let you do that.